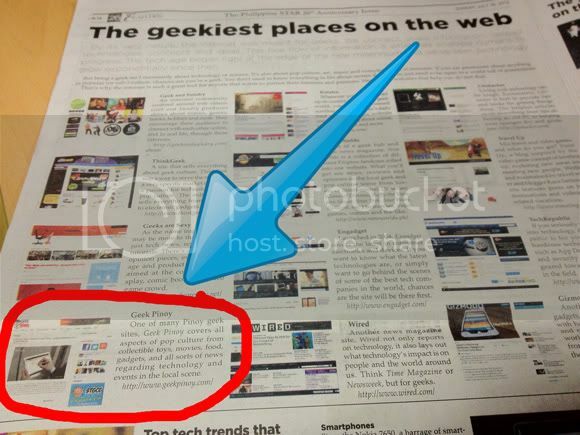 Apparently someone over at the Philippine Star thinks our blog is geeky enough to make the list of "The geekiest places on the web". To be honest I'm still wondering how we can make anyone's list let alone on a national newspaper's. Anyways, thanks to the accident err... vote of confidence! We're so thankful of the privilege and would probably lose sleep in the next few days from all the excitement of finally making it to the pages of print media. If someone just gave me a heads up I would've purchased thousands of copies of this issue just so I can show my grand kids and their grand kids the first time we got featured. I'm probably typing gibbirish by now so just go ahead and check the break for the other great sites that we're proud to be listed with. In case you haven't figured it out the source link is for PhilStar's website which doesn't have the same stuff on their printed media. I think just some of it, but if you've got some time to spare you can read their list of 26's. Woah! So were we! I didn't see the paper then so I didn't notice! Congrats to us! Wonder what they wrote about us. Need to find a copy of that paper. Apparently someone over at the Philippine Star thinks our blog is geeky enough to make the list of "The geekiest places on the web". To be honest I'm still wondering how we can make anyone's list let alone on a national newspaper's. Anyways, thanks to the accident err... vote of confidence! That would be me ;D And you're welcome. Your website's awesome and more Pinoy geeks should wear their badges proud and loud. Sorry for the late reply. One of the website owners on your list directed me to this page just recently. @Dandi - thanks a lot Sir! Yes, we're proud to be Pinoy!